Last weekend, we found ourselves heading up to Burlington, Vermont, for some light shopping and entertainment. One of the things I’ve always enjoyed about Burlington is that it has a good restaurant scene, with a lot of good-looking spots that I haven’t yet tried. 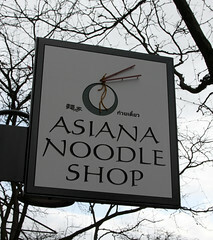 One of these that I noticed on a recent trip was Asiana Noodle Shop, nestled into a basement on Church St. Opened back in 2009 in a fairly dark subterranean space with the office-supply-store vibe that seems to be common with many Asian places, the folks at Asiana converted what used to be a burrito shop into a noodle houlse with a very extensive menu of Asian noodle dishes, as well as a fairly extensive sushi menu. And when I say extensive, I’m not kidding, the menu has several dozen noodle dishes, representing most of the Asian cuisines, ranging from Korea, to India, to Japan, to China. Oh, and Vietname and Thailand as well. 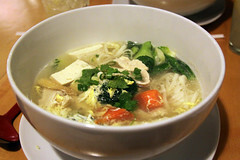 If that’s not enough, you can do some mixing and matching as well with their soups, combining whatever noodles you desire with whatever meat and soup base. So if you wanted tofu in a Tom Yum broth with Udon noodles, go for it. The beverage selection was quite interesting, though. I opted for an iced ginger green tea, and got a large glass of green tea that was approximately half grated ginger by volume. Aside from the slightly pulpy texture that resulted, I loved this drink, since I’m basically a ginger addict, and this delivered very nicely. 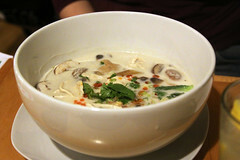 It also paired quite nicely with the broth from the sukiyaki. Carol opted for a lemonade, which was mixed up strongly, without too much sugar, and just a hint of salt like most of the Thai places I’ve been. A nice companion to her Tom Kar. Overall, Asiana did a rather good job on delivering the basic noodle shop experience, giving us flavorful and substantial lunches for a reasonable price. Sure, there’s a bit of room for improvement, but we’ll certainly keep Asiana on our list of Burlington go-to joints.